BAM eBay Blog | Are You Taking Advantage Of eBay Bucks Rewards? I tried the buyer auction manager and did like it. However, I haven't used the sniper features for ending auctions. 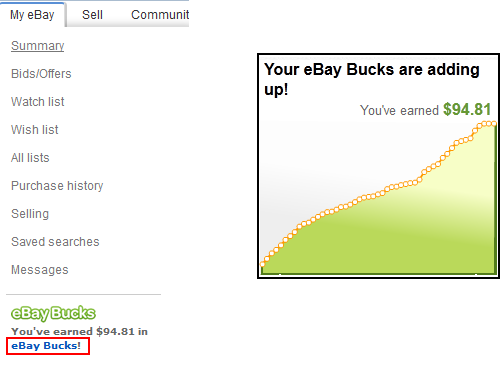 My question is, will I get ebay bucks if I use the sniper? I've read that ebay doesn't offer ebay bucks if they can identify that the auction has been sniped. "Some third-party automated bidding applications (sniping tools) are actually placing their bids on international sites as opposed to bidding on the US site directly. Purchases completed by these applications do not qualify to earn eBay Bucks." Buyer Auction Manager places your bids using the global site that you select in setup. If you select eBay United States or eBay Canada, your bid will be placed using that global site and you will earn eBay Bucks. I was issued a new Ebay certificate. Due to being busy I wasn't able to use it within a month. It expired. I was shocked, I asked Ebay to reissue it since I earned it over a 3 month period it only seems right to have 3 months to use. They said no. I have not and I will not buy anything from Ebay again. Sorry to hear that you lost your eBay bucks Jack. Yeah, eBay only gives you 30 days to use them so it's best to use them as soon as you get them so you don't end up forgetting. I can't believe you actually think eBay cares....good one.